I love the sun—an excellent reason for living in San Diego—however, because I live on the peninsula, I generally experience more fog than sun. I don’t love fog but the deep, steady cadence of fog horns stirs something deep and primal in me—perhaps I was a seafarer in a previous life? Hmmm . . . more likely I sold smelly fish dockside. . . . But when the sun breaks through the fog or marine layer on the peninsula—and bear with me here, because I’m about to go all sappy on you—when it does, it’s like a benediction. We celebrate the sun up on the point because it’s rarer here, and thus never taken for granted. When it happens, it is the absolute loveliest thing to wake to sun streaming through my windows. What I see on a clear day, down the hill, is a sail-studded bay and the graceful arch of the Coronado Bay Bridge, and beyond the bridge, the hills of Mexico. To the left of the bridge is a city of silver skyscrapers shining in the sun, cradling an airport. And that view, instead of fog, is what has greeted me every morning this past week, thanks to a high pressure ridge, and it’s something we’re expecting for another full week. It was four days ago, right after I sent the last read-through of my novel, The Angry Woman Suite, back to my editor, and was thinking, What’s next? What do I do next, first? (if that makes sense) that I opened the newspaper and looked straight on at a full-page color sketch of a 3-masted Spanish galleon—so beautiful, she took my breath away. The stuff of dreams, of magic and adventure. I jumped into her story. The galleon was called San Salvador, and she sailed into San Diego Bay in 1542—a full sixty-five years before the first English settlement on the North American continent. 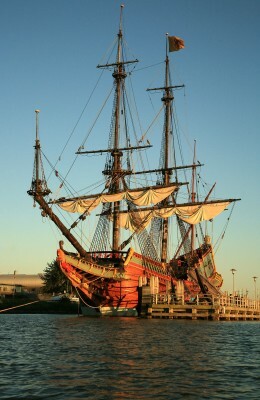 She was the flagship of an expedition led by Juan Cabrillo, the first European to explore San Diego Bay. Although Juan Cabrillo is memorialized by a statue at the tip of the peninsula, there is no remaining physical evidence of the beautiful San Salvador in San Diego. But, oh, it gets better. . . .
Because there’s going to be. 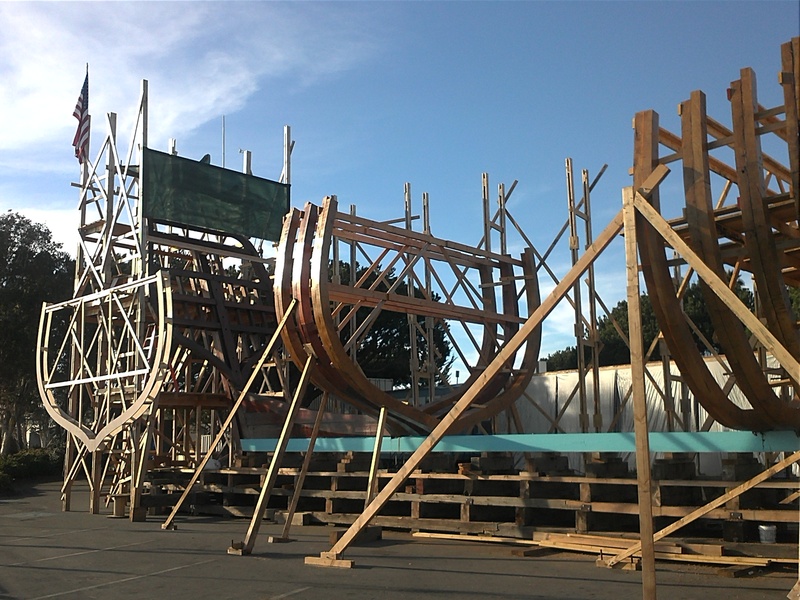 Funded in part by The San Diego Maritime Museum, and a very large contribution by an anonymous San Diegan, the museum is building a full-sized, historically accurate, working replica of Juan Cabrillo’s wooden ship. Okay, not literally. But almost. The San Salvador is being built on public land at Spanish Landing, across from the airport, an easy walk from my house—and so, of course, off I went with my brother, Brian, who also lives on the peninsula, a student of anything maritime and historical, to take a look at her. It was still early morning when we set out—as I said, an easy walk—and climbing the Nimitz St. bridge, caught a glimpse of long reddish “fingers” touching the bluest of skies. We walked twenty feet or so along a winding underpass, past a myriad of mysterious tools and band saws and huge stacks of wood, until we emerged bayside again; amazingly, right next to varnished oak cross ribs rising ark-like from the keel, the backbone of what will be, in a year or so, a 92-foot, 3-masted wooden ship. We didn’t speak . . . we walked the length of that keel and those ribs that look much like cathedral ribs turned skyward, and I imagined 16th century ship shipwrights piecing their wooden ships together without the help of naval historians or plans drawn on a computer and transmitted to a 93-foot by 35-foot lofting floor where today’s crew can look on a virtual drawing (made up of “jigsaw puzzle” pieces) of the ship for construction. So how did those 16th century shipwrights build their ships? By the seat of their pants, come to find out. Trial and error. And probably always asking themselves, What’s next? Because isn’t that what we all ask ourselves when we begin building something new for the first time, whether it be a house, a business, a painting, a Spanish galleon—or a novel? What’s next? How do I make this work? How do I make this the best of the best? How to start, which direction to go, how to make my “dream” workable, and solid and beautiful at the same time? And that’s what I think is so cool about us. By that, I mean the big “us.” The human race. We reach, we move forward, and we build things from nothing but dreams and visions. We are innovative, and though our penchant for momentum is what often makes us giant pains in the patooties, too, it more often—and definitely historically—is what makes the human condition magnificent. And that’s what I saw in that San Salvador skeleton. I saw “us” as builders—and it moved me, because the upside of us as a species is that we do bring the impossible to life. And if the first San Salvador, a “mere” vision before it became a launched reality and made history, wasn’t a stunning example of that, nothing is. And this second San Salvador was “just” a dream, too, before it became a keel and ribs on the beach—and the vision is that our second San Salvador will be used to travel the California coast as an ambassador for a city shining in the sun: San Diego. Interestingly—to me, anyway, but especially on my “San Salvador day”—I’ve been asking myself, What’s next? a lot lately. I’ve started a second novel, and it’s slow going, primarily because I’ve been working toward the launch of The Angry Woman Suite, my novel about a double murder and the ensuing fallout on two generations—and I also have a fulltime day job and an ill husband: I’m busy. But you know what they say about excuses. Plus, I don’t want to be one of those people who wave excuses around, until excuses become how they’re known. You know, like “the excuse lady.” Ugh. I don’t want to be that. What I want is to be a 16th century shipwright flying by the seat of her pants. Yes, I do. Because building a story is also like working with jigsaw puzzle pieces. Making up believable primary and secondary characters; constructing a story arc, a plot line, secondary plots, dialogue that is spot-on, narrative with momentum, building tension—and, oh, did I once mention cohesion in all this?—a story with cohesion, where everything fits perfectly together, coming right up! Whew, where to start? And when you close up shop for the night, where to start again the next night? Of course it would be easier to plop down in front of the TV and tell yourself you’ll “work it” when you’re feeling the inspiration, when life isn’t so busy, when the day job’s not so hard, when you’re not needed so much, when you’re not so tired or put-upon—which is exactly how novels don’t get written. And “plopping down” also guarantees a galleon won’t be built. Variations of this question have always defined us, from inventing the wheel through to re-inventing it a bazillion times more throughout millennia—but the answer to “what’s next?” has always been the same: stay with “it” . . . stay the course; otherwise you’ll never know about bringing something home. So there you have it. Easy-peasy (do you want to slap me now?). Whether it’s a ship you’re building, a career, a family, your first book or the second, commit, and then fly by the sea of your pants. Trial and error. Stay with the vision, if for no other reason than the sheer ballsiness of rising to a challenge, falling down, and picking yourself back up again, until you finally bring your vision home. Because bringing home a dream is about as good as it gets. As always, thanks for coming by! Till next time (and more on the ship and more on writing). . . . This entry was posted in A Writer's Life and tagged Lee Fullbright, San Diego Maritime Museum, San Salvador replica, The Angry Woman Suite, writers block, writing fiction. Really enjoyed this and it reminded me again of how wonderful it is to live in a city so rich in history & beauty!! 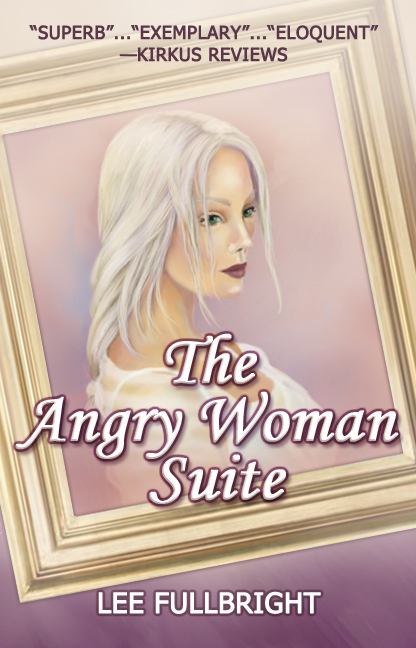 (And can’t wait to read The Angry Woman Suite!! I know– and it so gorgeous out there today– and I am stuck inside, in my little office, because why? :)Thanks for coming by!